Released in March 2002, Jedi Knight II: Jedi Outcast features a largely improved lightsaber battle system over its prequel Star Wars Jedi Knight: Dark Forces II. Along with many other improvements, this game makes you feel like a real Jedi once again. Best time, Jedi Master skill: 0:42:27 by Gustav 'recon' Jensen on 2013-03-28 in 100 segments appended to one file. I've loved this game ever since its release in 2002, both the single-player and the multi-player versions. Although I pretty much stopped playing single-player after I completed it the first few times and then switched to the very brilliant and addictive multi-player game, I revisited the single-player version again in recent time – this time as a quite experienced strafe jumper and Jedi slayer thanks to extensive multi-player adventures. I believe it was in April 2012 that I first started looking for shortcuts and tricks for completing the levels faster. The first one I found was the canyon jump in kejim_post which shortened the level by a huge factor. I started becoming curious about how fast this game could be completed, and I suddenly came to think of some of the impressive speedruns I had seen previously, especially runs of Half-Life. I wondered if a run of JK2 had been made, and to my excitement a search quickly led to LLCoolDave's Padawan run on SDA from 2005. I enthusiastically watched LLCoolDave's run and was at one time amazed by all of his findings – including the canyon jump that I too had tried – but at the same time I found that his movements were slower than what was possible, and that he spent excessive time on getting weapons and other dispensable stuff. I thought it could be done way faster. Specifically, credits go to LLCoolDave for a rough draft of a good speedrun – his speedrun from 2005, that is, which includes 'the corner jump' in ns_streets, the shortcut to Lando in ns_hideout, 'the climb' in cairn_bay, 'the laser skip' in cairn_reactor, and finally the concept of getting onto the Doomgiver in cairn_dock1 much earlier in the level than you're supposed to. I saw fit to incorporate these findings of his in my own run, with some modifications where appropriate. Furthermore, I saw on the forums that LLCoolDave since his speedrun from 2005 had made attempts at finishing a new run but never finished. He did however find an incredible trick in yavin_trials which I've used in this run and is described later. Credits also go to honorableJay for discovering a bizarre way of skipping some conversations with NPCs in the game. In particular, his finding is very useful in ns_starpad – see comments on this level for details on the method. Furthermore, in the level ns_streets, I use a very fast route of getting to the garbage collector, and this route is inspired by videos by gammadragon and Saratura in which they show that it's possible to jump directly to the garbage collector by jumping on top of a rodian guy. I modified this nice finding a bit by executing the jump without jumping on top of the rodian, making it a more feasible and fast route. Thanks to gammadragon for considering this route at first, and thanks to Saratura for succeeding in using the route successfully, showing that the jump was indeed possible. Saratura also gets credit for showing a nice 'laser skip' in kejim_base which was somewhat easy on Padawan skill and close to impossible on Jedi Master. I managed to pull it off, though. Thanks also to IsraeliRD for timing the run. 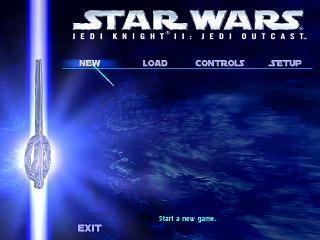 Last but not least, thanks to LucasArts and Raven Software for creating the best pc game I've ever played. I decided to do my run on the hardest skill level, Jedi Master. I thought that not only would I do a very fast speedrun; I'd also like to challenge myself further, which the many extra enemies, the reduced maximum hp and the enemies' extra durability and damage ensured. In 2013, more than seven years after LLCoolDave's run and more than ten years after the game's release, I found this apt. It would give a solid improvement and overall update considering the game's age and the now outdated speedrun. At first, I was worried that running the game on its hardest difficulty would slow me down considerably. This proved true in some cases – e.g. in 5th level where destroying the ATSTs is slower on Jedi Master, or the hangar battle in ns_starpad. In general, there are more enemies I have to counter, both when it comes to their annoyingly blocking my path and their attempts at getting rid of me. Later on, though, I find some skips that would not be possible on lower difficulties. The most noteworthy one is carried out in 4th level (artus_detention), where I take advantage of some NPCs that only seem to spawn on higher difficulties. I believe this saves some 30 seconds or possibly more. Moving on to level 17, there's a particular stormtrooper that I need to jump onto to make it up to a platform fast, making it possible to complete the level without any enemies hitting the alarms (which would trigger mission failure). I'll gladly admit that this run is very heavily segmented – a mere 25,5 seconds per segment is used on average, which means that the 100 segments in total generally are short. I don't personally have any problem with this heavy segmentation, because I think it's mostly justified considering the degree to which each segment is optimized and the routes, skips and tricks used. The sometimes short segments make very hard parts feasible to do, such as the R5 boosting in bespin_streets, the exploitation of floating NPCs in artus_detention, and the lightsaber skip in yavin_trials. To anyone who's against a large number of segments, I'll just point to the fact that a save penalty currently only is 0.5 seconds and therefore is worth it in very many cases. I'm simply taking advantage of that rule to optimise the time of my run. End product is a sub-43 minute run – more than a 20 minute improvement over the previous run on SDA. Looking at the intended length of this level, I think this one contains one of the most timesaving skips in the game. With enough speed, you can jump from near the beginning of the post onto a canyon and then right through a window leading to the level's end sequence. Just after getting through this window, there's a trigger just to the right that, if avoided, prevents three stormtroopers later on from spawning. This clears your path later on, and so is a must. After getting through the window, I make a segment break because it's a hard and luck dependant task to survive the next room with the three stormtroopers shooting at you, plus the next passages require some difficult jumping for optimal speed. An additional segment break in the final room ensures I can optimize the button pressing, which goes smoothly in my best attempt. A little trick here is used – by positioning yourself right, i.e. in the middle between two buttons, you can press two buttons at a time instead of one, which saves some seconds. A note on the route I use in the beginning of the level: I found that it was actually faster to go the intended route (i.e. left to the ship), instead of jumping up to the ship from some crates, or even jumping straight up to the ledge to the right of the ship, which turned out possible but very difficult. The simple reason for this is that going to the left allows you to accelerate up to a very fast speed that, if kept, beats the other possible routes. I also found that getting up the ledge to the right and moving on from there triggered Jan's death very often, making it an unfeasible route. As you can probably imagine, getting away from the compact room in the beginning with 11 hp, zero shields and seven enemies shooting at you is, well, hard, and depends very much on luck. Not to mention the difficulty in correctly pressing the button so you can open the door before dying (these particular buttons are a source of great annoyance when running this game). Luckily it was possible. Soon after, in the room containing the ice "container", a little time can be saved by pressing only the first button for the reason that you normally would have to wait a second or so to be able to press the second button. Shortly after the ice room, I lose a little time by going to a secret area with thermal detonators. These, however, prove useful later in the run and are ultimately worth getting (I reckon). Later, I use the mine skip trick which involves jumping past a trip mine set up by stormtroopers which explodes very soon after you have the opportunity to jump past it. Thanks to Saratura for this gem. After this comes the most difficult part of the level: the room with the lieutenant shooting at you with a machine blaster and the many stormtroopers. Surviving this room in a fast manner is very difficult, and it requires both luck and swift movements to get a good run, which I to my relief managed to do after very many attempts. This level contains two very timesaving shortcuts. The first one is to simply jump over the green river near the beginning; this gets you to a place you're only supposed to get to much later. The second one is to get onto the air cart without deactivating the red laser beam. There are a few ways to do this, and I choose one where I must kill some imperial workers without getting hit by them. In turn, I get trip mine explosives and additionally, the path I choose allows me to get onto the air cart with zero hp or shield loss. The most difficult part of this level is the part with the console where you must kill a handful of enemies in order to press a button. I figured that using explosives would be fastest, but it was hard to get 'em all when they were spread over so much space. Once again, it required luck to get most of them into the same spot so I could blow them up with mines. Where to begin with this monstrosity of a level? It's the longest one in my speedrun – even after utilizing major as well as minor skips and tricks – and it's also the most annoying one to finish. There were many short parts I found hard to do quickly – even running up the many stairs – so I made a lot of segment breaks. In retrospect, perhaps unnecessarily many – particularly in the beginning. But you simply cannot persuade me into redoing this frustrating level more than I have already. Indeed, I have redone more than half the level because of an, dare I say, awesome shortcut I found much later on in the running process. I'm not going to spoil it here – you should see it yourself. I can reveal that it happens right before the room with the lieutenants and the control buttons which you normally would press (on the last flight of stairs), and it involves jumping onto some floating NPCs. At least, I was utterly flabbergasted when I first discovered that this shortcut was possible. It did require a lot of attempts and, yet again, luck to attain the perfect circumstances – getting the NPCs to the right place, that is. Largely thanks to this skip, the completion time of this level goes under five minutes, which was a milestone for me. Shortly after this skip, I am on my way down through an air shaft in which the gust is deliberately not activated; this allows for a faster way down. The things you can step on in the side ensure you don't take fatal fall damage. With 50 hp as the maximum on the hardest skill level, I was worried that it would not be possible to survive using this method, but with five bactas it was. Following this is the green mine section of the level, which is just plain annoying. I did not manage to get a perfect run in this mine at all, but I'm pretty satisfied with my best attempt, which was at least half a second faster than all of my other attempts. Most of the time I would get blocked by the bugs several times, but in the best attempt I only get blocked by one iirc. Moving on to the place with the imperial hostage, this part also contains a few noteworthy things. First, you can skip killing the stormtroopers prior; even if you have to meet them afterward, they will not attack you because you're holding the imperial commander as hostage. So you save time by not having to kill these stormtroopers. That's not the end of the story, though. They really like to get in your way and you must block their path before they block yours, which is difficult. They also like to block your line of sight when aiming at the commander, which of course is annoying since this line of sight is necessary for maintaining the lieutenant's movement – this was especially annoying in the second hallway (with the stairs) where stormtroopers 1/2 of the time would interrupt. Second, you can employ quite an amusing method to make the commander 'move' faster. By using trip mines or other explosives, you can boost the commander forward by placing them behind him. Unfortunately, you can hardly do this two times as he does not have sufficient hp (if he dies, the story's over). I only managed to use this boost one time, which is a shame – things would be way faster if the boost could be done repeatedly. At the end of the flight of stairs with a button that the commander presses for you, opening a door, I use a segment break which seemingly speeds up the imperial's pressing of the button – I believe this saves a second or two. After the commander opens the final door for you, he and the stormtroopers will start shooting at you again, so at this point you just run like hell to the exit. Fun fact: Levelwise, I've done the biggest improvements in this level compared to any other level in the run. My first time was 5:22, then 4:24 and finally 4:12 (not accounting for save penalties). I remember being somewhat satisfied with the first time, so it goes to show that even if something looks satisfying in a run, there may still be many opportunities for improvement. The sequence in the beginning where you use a machine blaster to kill stormtroopers is quite hard to optimize. Sometimes the ATST would appear quicker than otherwise, even if my shooting of the stormtroopers wasn't that good. The segment of this in the final video is not in any way smooth, and yet, all of my other attempts were at least half a second slower, despite many of them being much more polished. There may be some mechanism behind the stormtrooper spawns at this point that should be figured out in order to optimize this segment. Overall, most of this level is difficult – especially on Jedi Master difficulty – due to the very many enemies shooting at you. In particular, the control room with the console button late in the level is hard to survive due to the many imperial officers and commanders. I was surprised I even managed to survive that part without clearing most of the enemies beforehand because there were so many. The third and last ATST is also very hard to destroy in one go on hardest difficulty; often it will send deadly bolts at you before you can finish it. Luck was required here to make it. Fun fact: in the last room before meeting Desann (the room with laser trip mines), you can actually jump over the first two laser mines with some luck, and without making them detonate (this is why I made a new segment at this point). This one is a fun level to speedrun because it's all about moving fast – no annoying enemies that block your path or other crap you have to do. In the beginning of the level there's taken advantage of a skip that involves saving at some point during a conversation with another NPC, in this case C3PO. Upon loading, the conversation is over and you can move freely. This saves a few seconds. Later in the level, I find it necessary to make a segment break before a difficult place where you must jump 'through' a gate while it's opening. This level contains one of the major skips in this game, and it's about as ingenious as it gets. Credits go to LLCoolDave for discovering this gem: In the room before you attain force jump, you can actually reach the rising pillar which has the lightsaber on top of it inside a cage. Incredibly, if you're fast enough, you can walk onto a little stick on the side of the pillar and by using force push while standing on it, you're boosted up to the cage. This is where it gets even crazier. By standing in front of the cage containing the lightsaber and by walking into the cage at certain angles, you can make the cage open and get the lightsaber! The pillar will then continue to move up and you arrive at the very end scenery of the level. It's quite amazing that such a trick is possible. I'm not sure how much time this insane skip saves, but I'm guessing very much. The first major skip in this level is after you've escaped the bar scene. I call it 'the corner jump', since it involves jumping around a corner to get to a point you're only supposed to get to a bit later – this saves quite some time. Moving on, the next and final destination of the level is the garbage collector which takes you to the exit. There are numerous ways to get to it, and I won't explain them all in detail. The way I use in the run is most likely the fastest possible – it's to jump directly from the platform parallel to the garbage collector and then onto it. This jump seemed impossible at first, but with a strategy involving a swift turnaround and a boost by jumping onto a window thingy, enough speed can be generated and you can jump just long enough to reach the collector. Bear in mind that at this point, I've only gotten rid of one out of the many snipers shooting at you. The garbage ride would seem hopeless then, wouldn't it? I thought so at first, too. But once again, with luck and energetic jumps while on the garbage collector, it's possible to survive the ride – in fact, I had luck to get hit only one time by the snipers in my best attempt. I did however take one precaution, and that was to get rid of one of the snipers while on the ride by shooting it with a Wookie Bowcaster I picked up earlier in the level. I'm surprised I made it. The next level starts with 39 hps and 1 shields, which is different from the 50 hps and 20 shields that I end this level with. The reason for that is that I redid this entire level (ns_streets) later in the running process, improving it by more than 10 seconds. You will perhaps notice these inconsistencies in hp and shields later on in the run at other points where I have improved the run as well. As far as I'm concerned, these inconsistencies are OK insofar as I'm not giving myself an advantage – instead, what happens is much to the contrary (e.g. I lose hps between segments instead of gaining). There's a very timesaving skip in this level that involves destroying a fire crate from a narrow window. This gets you straight to Lando where you're only supposed to go much later. I believe LLCoolDave was the first to discover this skip, so credits go to him. On my way from Lando to the room with the voice asking for a password, I use a very fast way of getting up there. It involves jumping onto a garbage container and then on to the above platform. In the last segment, beginning at the big arena later, I think my getting rid of the turrets could be improved. Using weapon number 5 would likely be faster, and as would using thermal detonators like Bacn did in his speedrun. The humanoids shortly after were also a hassle to kill quickly. After some experiments, I concluded that the fastest way to wipe them out was to use force speed and simply move the lightsaber into them without slashing. I found that explosives were slower because I couldn't get many of the humanoids at one time since they were running all over the place. Overall, there's definitely room for improvement in this last segment, but it's just a very annoying one. In the room with the view to Lady Luck (Lando's aircraft), there's an amusing conversation skip: by standing with your lightsaber against a wall, you can somehow skip most of the conversation, which originally is quite long. Credits go to honorableJay for this gem. I really can't imagine how this was discovered, but it's a very nice trick. After this convo skip, I use an obvious, fast way of getting up to the room with the first button you need to press to open the hangar's gate: You can jump up to that place from the edge of a door, as LLCoolDave did in his run too. What follows is the dreadful hangar scene (the room with the Lady Luck). This part of the level depends very much on randomness. First, to make the segment as fast as possible, I required that the first wave of enemies spawn at the end of the hangar (at the back of the Lady Luck). Thankfully this seems to happen all of the time; however, there would sometimes be differences in how big the enemy wave was. Sometimes it would be huge, meaning I had to try again. After crushing this first wave with thermal detonators, the next wave of enemies should preferably spawn at the first end of the hangar (at the front of Lady Luck). This did not happen as often as I'd like it to and, again, sometimes the group of enemies would be huge compared to other times, and there were even times where enemies would spawn at both ends of the hangar. In addition, to make it as fast as possible, Lando would have to neglect these enemies instead of attacking them – he should run to the back of the ship so he immediately could trigger the appearance of the next and final enemy wave once I'd finished with the current enemy wave. Lando, however, was rarely cooperative and he would either attack the enemy wave I was getting at without his help, or he would run around back and forth hopelessly in a bugged state in which the next wave surely wouldn't spawn. Finally, if he did cooperate, I required that the final wave of enemies spawned at the end of the hangar (at the back of the Lady Luck), and this too happened randomly. Sometimes the enemy wave would spawn at the other end of the hangar, which meant I'd had to reattempt. As you can see, this was an annoying segment to do. There are just a few other things about this scene I should say. First, just when getting inside the hangar, Lando starts talking for a little while. Using honorableJay's neat convo skip, I found that you can jump straight to the end of the hangar, move your lightsaber into a wall, and the first enemy wave will appear almost immediately. Nice. Second, thermal detonators were the ultimate weapon for wiping out all of the necessary enemies. The maximum number of ten I had to begin with proved inadequate, but fortunately, you can pick up some of the detonators that the three-eyed space aliens sometimes leave behind when killed. Having more detonators at hand, wiping out the last wave of enemies was much faster (and easier to do without taking damage). Moving on, there's just a lot of button pressing, avoiding of enemies and snipers, and well, fast movements. Nothing special. But do notice how Lando gets his head fried by Kyle's lightsaber at the end of the level. Most of this level is plain and boring. The main place of interest is the part after the wind tunnel: the place where you're in a very large area and move up by gusts. These gusts seem to come and go randomly. For that reason, it took quite a few attempts to have all of the gusts come with perfect timing. Amusingly, I lose my lightsaber in this segment by throwing it while flying upward, but it doesn't slow my progress at all since I magically get it back before the second Reborn where I first need it again. Another funny thing is my way of killing the first Reborn. I decide to get rid of him by blocking his path in the air, thus making him fall into oblivion. In the run you will not see his fall, but if you listen closely, you can hear his death cry. Killing the second boss Reborn (the red one) wasn't initially an easy task on hardest difficulty; on easier difficulties it would have been an acrobat Reborn (the blue one) instead, which could have been killed by a simple thermal detonator. Luckily though, I found that if you move toward the place above where the Reborn's standing, he will move down to get you, and while he's in the air, you can use force push to make him fall to the ground without any chance dependence. At this point, all it takes is a few lightsaber strokes to get him. (When enemy Jedi are force pushed while they're in the air by means other than jumping, it seems to be a rule that they're knocked to the ground. I took advantage of this.). At the end of the level, time is also gained by manipulating the R5 unit's movements; you can use force pull and push to have it move at your mercy. This has to be one of my favourite levels in the run, especially after discovering three major skips/tricks. First of all, you can use force push to make the R5 unit move much faster forward, as was exploited in the end of bespin_undercity. Now, this is where it gets fun: In the hallway in the beginning with the laser mines and the enemies shooting at you from a distance, there's a very fast way of getting R5 to the end of the hallway without blowing all the mines beforehand. With correct angles and timing (and much luck), you can use force push to make R5 'jump' over some of the laser mines. Do this two times correctly, and you're about halfway. At this point, it gets absolutely crazy in the run. Nothing of the following was planned and happened solely by chance; I would never have hoped that the following was possible, much less expect it to happen while I was running and recording: By using force push again, R5 is boosted into a laser mine – and very luckily, he hits it without blowing up. This gives him a boost higher into the air while still moving forward. The boost is so crazy that R5 moves just above two lasers on top of each other, and after this, he moves in between another two lasers – without hitting any of them! It's quite an incredible sight if you ask me. If I had to pick a single place in this speedrun where extreme luck helps lower my completion time, this would definitely be it. In short, R5 gets across the hallway in a matter of five seconds. And don't worry – the party in this level is not over yet (in fact, the party in this level doesn't end at all). There's a neat way of skipping a huge chunk of the level (including the long unskippable convo with the bespin officer) by… using your surroundings. In the area with the acrobat Reborn, do as follows. Kill the four enemies present – this triggers the Reborn's appearance on the ground above. Now, when the Reborn jumps down to get you, use your best timing and jump on top of him in the air – and, effectively standing on the Reborn in the air, jump up to the above ground. You're now at a place where you can easily continue to finish the level, and you've skipped a great deal of the level. It felt hopeless when first attempting this trick, but amazingly, it's possible with good timing. And as said, the party's not over yet. I managed to find a cool way of saving 4-5 seconds. Yes, that's a modest timesaver, but I would likely include it even if it were slower, for the simple reason that it's insanely cool. After using the Reborn to get up to a platform, I continue to another place where you're not intended to go, first by jumping haphazardly on a side wall where you only seem to be able to jump from a small percentage of the time. I was lucky it was possible at all, because the fact that this is possible enables me to get to another obscure place, from where I can jump up to some other platforms by using a sloped wall. I can't even explain that stuff, just watch it. It seems that being adventurous in this level gets you far, let's just say that. Moving on, and having skipped a good portion of the normal route of the level, we're getting to the last room where you must use an imperial commander's keys to unlock the door to the exit. On your way up the elevator to this room, you can actually stop the commander from fleeing from you by shooting up into the roof. If luck serves you, the commander will run toward the elevator, which enables you to kill him faster and thus finish the level faster. My first time for this level was over three minutes, but thanks to aforementioned cunningness, it's dropped down to under a minute and a half. Needless to say this level is the highlight of my choice in this run – it's sort of got it all: spectacular shortcuts, out of bounds-action, fast movements and extremely favourable luck (the R5 scene). A short level. In the place with the many trip mines close to the beginning of the level, you can just make them detonate by hitting them at the farthest point to the right – this way your distance to the explosives will be so great that you won't take any damage. I take advantage of this in the run. Moving on to the second 'boss' in the game, Tavion, my strategy is quite simple: jump on top of her (making her fall to the ground), and make sure your lightsaber is in touch with her until her demise. Time required to get rid of her: three seconds. I really appreciate the fact that Tavion falls to the ground like any other Jedi when you jump on top of her; were it not for this method, getting rid of her would be much harder. The main skip in this level is 'the climb' in the big room, discovered by LLCoolDave, which saves a huge amount of time. I just found a faster way to begin it. If you go to the right in the big room, there are some edges you can jump up to. From here, you can jump straight up to the place where the climb begins. To my surprise, I managed to do the climb pretty fast while only losing 18 shield points – not to say it didn't take many tries, however, as you can see in the bloopers! It may have helped that I used force pull to disarm a stormtrooper holding the deadliest weapon – 'FC1 Flechette Weapon' (weapon 8). There's not much else to comment on in this level. I found no way of skipping the long, boring elevator sequence in the end. However, entertainment is provided by using a little exploit that enables you to use force heal rank 1 to heal quicker. It involves using force heal and then moving forward, which stops the force heal effect. This is repeated very fast until you've reached enough hp. If done right, this seems to be faster (and maybe even more force-efficient?) than using the force power ability as intended – i.e. sitting down. There's also a point at which I take a long fall down to a very narrow doorway. When landing on this narrow doorway, I take advantage of the fact that rolling on the ground after falling makes you take less damage. To actually perform this roll on such narrow space, I changed the 'arrow key velocity' (the velocity with which your view 'rotates' when pressing the arrow keys) to a very high value, ensuring that I didn't fall into oblivion when doing the roll. The reason I do a segment break pretty early in this level is that there's a very hard jump in the room you enter after you take the first elevator down. I would get it maybe 1/20 of the time, so having a segment break here made the jump feasible. Later in the level, on my way up the elevator leading to the control room with many imperial officers, I use the aforementioned force heal exploit to restore my hp before moving on. I couldhave used bactas, but that would be uninteresting. Only the last two spawning Reborn in this level are necessary to kill for the last gate to open, so time is saved by skipping the first three Reborn. Furthermore, it's possible to jump right past the ATST in the narrow space there is in the doorway it's standing in. It's just a very difficult jump because the ATST's hitbox is very large, and very often, I would get stuck or even smashed by the ATST. What was even worse, though, was the part after the ATST. That part involves some very calculated jumps and turnarounds to be done quickly and without getting blown up by the trip mines in the first place. As a matter of fact, this may be one of the single segments that I've spent most time on, and not without reason. First, you are somewhat dependant on luck to wipe out the two Reborn Jedi in a fast manner, since a) their movements are mostly unpredictable and b) the lunge saber attack doesn't always happen when you want it to. Second, jumping past the ATST is very difficult, and third, so is surviving the trip mine part in a fast manner. In the beginning of this level, I use a stronker version of LLCoolDave's skip that gets you faster to the button that deactivates the green lasers. It involves using force speed and, with good timing, jumping fast through a hole to the place with the button deactivating the lasers. Moving on, in the rooms with the rotating red cylinders, I use a variety of methods to go a little faster; one of them involves a jump through a narrow hole that surprisingly was possible to get through, saving some seconds. In the long room with the cylinder that has spikes, it was also possible to get to the next room without triggering some enemies' spawning, which saved some time. I'm not sure how I avoided this NPC trigger – it just happened to me randomly. Next, in the big area with the rising platform, there's a nice major skip you can do. It involves using force speed, jumping with high velocity on top of a NPC, and from there jumping up to the moving platform. In the last room with the many elevators that follows, I employ a faster method of getting down from the highest floor. Instead of taking the slow elevators down, I use gravity to my advantage and jump long distances down just accurately without dying from fall damage. This level is another of my favourites. First, killing the two shadowtroopers is easy – just use force pull to throw them high up in the air, making them fall to their doom. Yay for force pull rank 3. Second, in the big wide area with the Doomgiver ship, I discovered that it was possible to not kill any enemies and still finish the level without any enemies hitting the alarms. As LLCoolDave did in his run, you can get up to the ship very fast with some jumps; I just use a significantly faster route that involves jumping on top of a stormtrooper that only spawns on higher difficulties. In fact, were it not for this fast route to the Doomgiver, I'm not even sure it would be possible to finish the level without killing any of the enemies, since in most cases they would hit the alarms – even after getting to the end of the level. That's right – sometimes the alarm would be hit during the cutscene with Luke! Once again, it requires luck (as well as fast movements) to do this; 90 % of the time, the alarm would be hit before I could finish the level completely. It's pretty nice to see that such a massive level can be finished in under a minute. Back in the years when I played this game as a newbie, I believe this was, indeed, the one level I spent most time on finishing – the damn alarms prevent you from going berserk like one normally would do. With this run, I found a way around. There's nothing too interesting in this level. I generally just make use of swift movements to complete the level fast. The first segment was annoying because it involved killing a fencer Reborn (the green ones) with a lunge saber attack. To my annoyance, these attacks don't always occur when you want them to in single-player – in fact, they have a tendency to not occur just when you want them to. And so, it did take some luck for it to happen after getting a good run, hence my making a new segment immediately after killing the Reborn. In the underground place you get to after taking the first elevator down, I use an alternate way of getting up to the button that opens the next gate. As in level 16, I jump onto a robot NPC from which I can jump up to the place with the button instead of taking the elevator. The few tests I carried out showed that this way was a little faster (under a second), but to be honest, the tests were not at all thorough, so I'm not exactly sure if it is faster. I decided it looked cool and included it mostly for this reason, in the hope that it was indeed faster. Moving on, surviving the big room with the many imperial officers and stormtroopers without wiping them out beforehand was difficult, especially because I had to press an annoyingly small button while standing with my back against the enemies, making me very vulnerable to attacks. It was also difficult to kill the two boss Reborn a little after – I was dependent on luck for my force push to knock them down to the ground so I could kill them fast with a few strokes. In the finishing part of the level in which you reunite with Jan, I found no way of skipping the door opening scene. There's an invisible wall on each door that only disappears when you do as you're supposed to. In the first segment of this level, it's very hard to get a smooth run mainly because stormtroopers like to get in your way. I did manage to get one good go, but unfortunately, some point during it, I stand for a quarter of a second or so without doing anything – I think I had an itch or something like that, which was a very bad moment since it turned out to be the best run I'd ever get. Every attempt (which were many) I did afterward was at least a half a second slower. Moving on, Galak Fyaar turned out to be a much easier kill than anticipated. In fact, it was possible to kill him quickly without losing any hps or shields. My strategy was to first use my saber to deactivate his bubble shield, then use "Golan Arms FC1 Flechette Weapon" to hit the red thing behind his head. This takes him to the ground, and, using force speed, wiping him out with said weapon is easy – he's dead before he even can rise up from the ground. What follows is one of the most annoying segments in the entire speedrun – the zero gravity part of the level. It might not look smooth at all times, but try it yourself and see if you can navigate well consistently with zero gravity. I sure found it hard. This level turned out to be more difficult than I thought it would be initially. Since the force power regeneration is limited, you have to use your force jumps sparsely. You also have to navigate around obstacles such as trees, and the varying hillsides make it hard to optimize your jumps. For these reasons I decided to make a segment break so that I could optimise the run of this level. Still, the result is not perfect; there's room for improvement, especially in the first segment. For now though, I've had enough of this level. Sub-minute, anyone? This one is all about timing your jumps so that you land on hillsides that boost your movements. My run in this level is not perfect, but I'm pretty satisfied with the end where I save some time by jumping to the right of the pod in the last bit. The run, however, can definitely be improved by using more advantageous hillsides. In the first room with Jedi fights, I decided to carry out some experiments to ascertain the mechanism behind 'the missile launch', which is necessary to trigger to be able to move on toward the exit of the level. What I did was the following: I aided the evil Jedi in killing the good Jedi on my side and then made sure that all of the evil Jedi were alive. I then used the notarget cheat so that the evil Jedi wouldn't attack me, and I then saved the game. Loading that game several times, these evil Jedi then took turns to get wiped out by me so that I could find out if killing certain Jedi triggered the missile launch. After several tests, my conclusion simply was that any of the two evil Jedi dying triggers the missile launch. With this knowledge, I endeavoured to kill two Jedi as fast as possible in my attempts. In some attempts though, the other Jedi on my side would be quick enough to kill an evil Jedi for me, which meant I only had to take down one myself. There was taken advantage of this in my best attempt. Moving on to the part after the missile launch, you can skip every evil Jedi (except for the last two), which is kind of disappointing. Did the developers not think of the possibility that a player just can jump straight past these Jedi and still finish? I for one would have enjoyed getting rid of these in the run… Ah well, I do get the pleasure of giving each of the two shadowtroopers in the end a beating. The red saber style is too stronk. In the first segment, getting past the flames alive without deactivating them seemed like a hazardous task at first. Fortunately, I found an easy and fast way of skipping them: By using force speed and jumping up into the sloped roof, you get a massive speed boost and can thereby jump straight past the flames without any health loss. Right after this, there's a pipe you need to break for water to flow down to a fire you need to get past. Normally, one would break this pipe by running toward it and then throw your lightsaber at it, but my way of using the Wookie Bowcaster at a distance to break it is significantly faster. The next segment involves some swift movements and jumps to get past the moving walls as fast as possible. Rather difficult at first, but manageable once you've trained it. After this, we're already reaching the end of this run – the battle against the final boss, Desann. I can imagine that some viewers anticipate some kind of magnificent, heroic battle. I regret having to inform these viewers that Kyle disappoints with a momentary anti-climax. Desann expires from two solid strokes from Kyle's lightsaber, and that event concludes this speedrun. I hope you enjoyed the run. If you have any questions, comments, or whatever, you can contact me at reconn999@gmail.com.